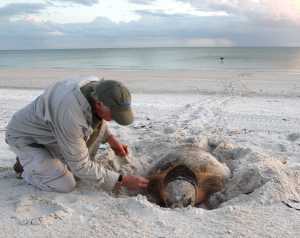 Summary: Loggerhead foraging patterns in the Gulf of Mexico have not been widely studied. However, stable isotope analysis combined with satellite tracking in this study provides an effective approach to uncovering long-term resource-use patterns in the population. We will analyze microlayers of scute samples collected from 30 satellite-tracked and 40 additional nesting females from Florida?s west coast. Stable isotope analysis of loggerhead scute samples can provide several years of foraging data that integrates diet, habitat use, and geographical location. Pairing tracking data with isotopic records will be used to develop an isotopic map if turtles from distinct foraging grounds differ in their isotopic values. This information can be used to assign untracked females to probable foraging grounds based on isotopic data. Therefore, it is possible to estimate the proportion of the nesting population using different foraging grounds using a larger sample size than is possible with satellite telemetry. Finally, single scute samples provide the opportunity to look at serial samples over the individual?s foraging history to assess consistency in resource use and determine whether individuals demonstrate high fidelity to foraging areas. Overall, this information is helpful to assess population dynamics and potential interactions with anthropogenic activities. Results: This study is an excellent example of how basic research can create a valuable management tool for the conservation of sea turtles. Using stable isotope values of carbon and nitrogen in scute or skin samples, we can now assign loggerheads nesting along the west coast of Florida and in the Dry Tortugas to their foraging region with an accuracy of 87%. This technique replaces the high cost of satellite telemetry with a $10 analysis. Knowing the foraging region of nesting female loggerheads each year allows us to evaluate which foraging regions are contributing to each nesting aggregation and to determine if changes in numbers of nesting females is a result of changes in one or several foraging regions. For example, we could determine that the decline in nesting numbers at a given beach is the result of drastic declines in one foraging region while the numbers of nesting females from other regions are constant. This information would allow us to direct conservation resources to the one foraging region that is in greatest need.